Mazda today announced that the new MX-5 Special Edition with styling and suspension upgrades is now available in Australian showrooms in limited numbers. The world's most popular two-seat roadster, Mazda MX-5, is celebrating its 20th anniversary with another prestigious motoring award. The Mazda MX-5, the world's favourite roadster, is about to get even better. 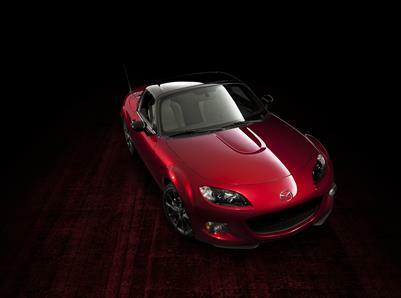 Happy 20th Birthday Mazda MX-5! This week Mazda celebrates the 20th anniversary of the Mazda MX-5, the world's best-selling lightweight two-seat roadster. This month Mazda adds more exclusivity and desirability to its iconic MX-5 sports car by introducing a Limited Edition model. Just 110 examples will be sold country wide. Mazda has added an exciting new dimension to the world's best-selling roadster, a powered retractable hard top model that boosts the MX-5's practical appeal, while maintaining the car's legendary fun to drive feel. The briefing for Mazda designers left no doubt: "Remain true to the basic design principles of the third-generation MX-5, while creating a new roadster coupe with its own, exciting identity."